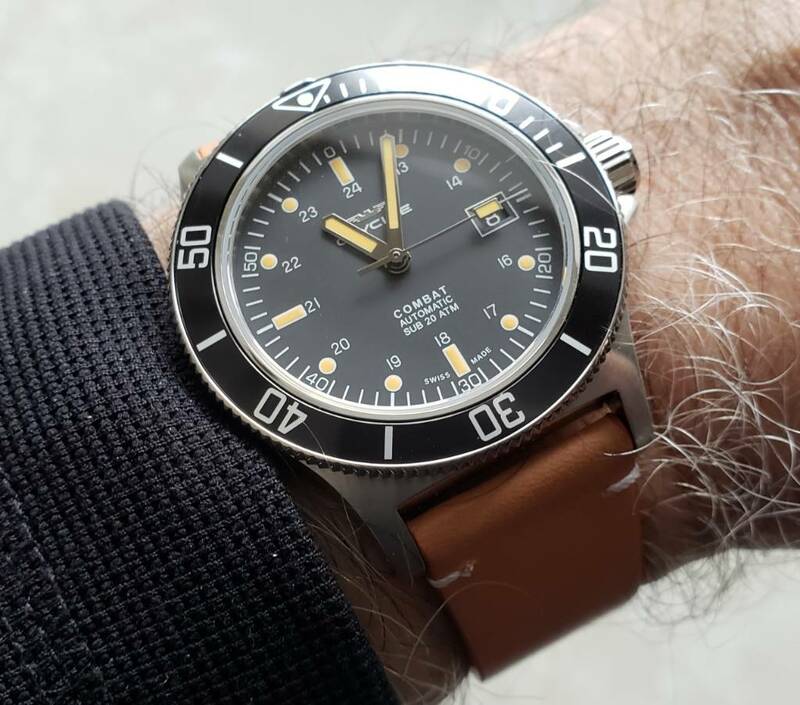 Like many on the recent MassDrop, I'm looking for a (hopefully) case-fitted SS bracelet for a 42mm Combat Sub.....would prefer not to go with a straight bar aftermarket if I can avoid it, and I'd even consider a decent fitted silicone/rubber strap if it was not too thick as the beautify of the Combat Sub (for me) lies in its 10mm height.....does anyone have any suggestions? The Nato's they ship with are fine, but I'd like to wear these with a cuffed dress shirt and frankly the Nato is getting in the way. This watch is pretty close to perfect for me in terms of size and shape, but I need to mix up the bands and bracelets now. I'd even pay premium for Glycine OEM options on the straps but I'll be damned if I can find anyone that actually sells them...including the direct sellers on eBay basically said "sorry, nope" when I asked about OEM bands. I put mine on an aftermarket leather strap and it looks great. I'm on the hunt myself for a good quality rubber strap for the summer. I'm also eventually going to pick up a Staib mesh bracelet. Although that has straight end links that don't curve around the case, it will give the watch a great vintage feel. Combats look better on vintage leather straps with minimal stitch configuration. Otherwise it looks like a Seiko and 20 others that copy the Combat look. If you must wear metal, try the incredible Razor vintage from Strap Code. I use them on many watches. Unique and comfortable. But you might not find one with curved lugs. Your other easy choice that always looks great is the Shark Mesh but get one with removable links. The watch is a no nonsense watch and I would not want an Oyster type bracelet as it will make it look like a Rolex. I didn't think I would like that bracelet until I saw your pics. Very nice! where to find curved end bracelet for the 2000 meter case?? Where to find a Yabokies bracelet for an Ecozilla? Where to find a replacement bracelet for a SEIKO 5? Where to find a oysterstyle bracelet for Seiko spirit?